María de los Ángeles Gómez González, senior member of the D&I research group, has received the ‘Rafael Monroy’ Senior Researcher Award, granted by the Spanish Society for Applied Linguistics (AESLA). This edited volume explores why artistically ambitious women writers continue turning to the short story, a genre that has not yet attained the degree of literary prestige and social recognition the novel has had in the modern period. In this timely volume, the editors endorse the view that the genre still retains its potential as a vehicle for the expression of female experience alternative to and/or critical with dominant patriarchal ideology present at the very onset of the development of the modern British short story at the turn of the nineteenth century. More Information. This edited volume showcases new work on discourse analysis by big names in the field and promising early-career researchers. Arising from the latest in the series of IWoDA workshops in Santiago de Compostela, it provides novel insights into both the explicit and the implicit characteristics of discourse as used in verbal interaction. Discourse markers, as their name indicates, are among the explicit signals of coherence, while discourse relations may be either explicit or implicit. Similarly, the discourse used for purposes of evaluation, stance-taking and interpersonal engagement is either overt or covert, as is also true of the expression of emotions and empathy. This, in general terms, is the challenging terrain into which the contributors to this volume have ventured. The book combines theoretical issues with a practical orientation, comparing languages, analysing different registers, studying the openings of Skype conversations, and much more besides; it will prove highly relevant for postgraduate and advanced practitioners of discourse analysis, interaction studies, semantics and pragmatics. More Information. New edition of IWoDA, to be held at the Faculty of Philology, 26-27 September 2018. The aim of IWoDA is to promote multidisciplinary research on the analysis of discourse, pondering and exploring the multifaceted properties of English-language texts/discourse from different perspectives (quantitative, qualitative, linguistic, cognitive, psycholinguistic, contrastive, sociolinguistic, critical, literary, cultural, filmic, semiotic, etc.). More Information. 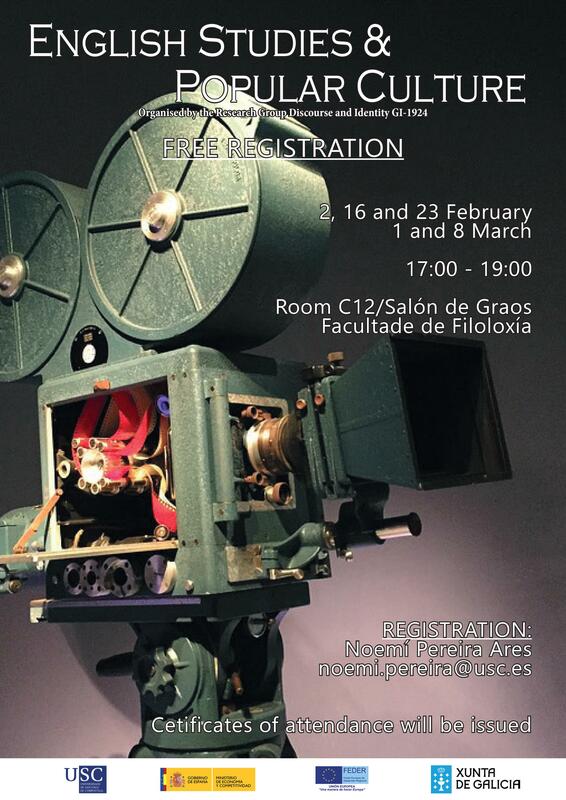 The D&I Research Group will host the XVII International AEDEI Conference from May 31st to June 1st. This year the conference is particularly aimed at stimulating critical debate on the Irish environment through Irish literature and culture. More Information. Sandra Gómez González has obtained a predoctoral research grant from the Xunta de Galicia. 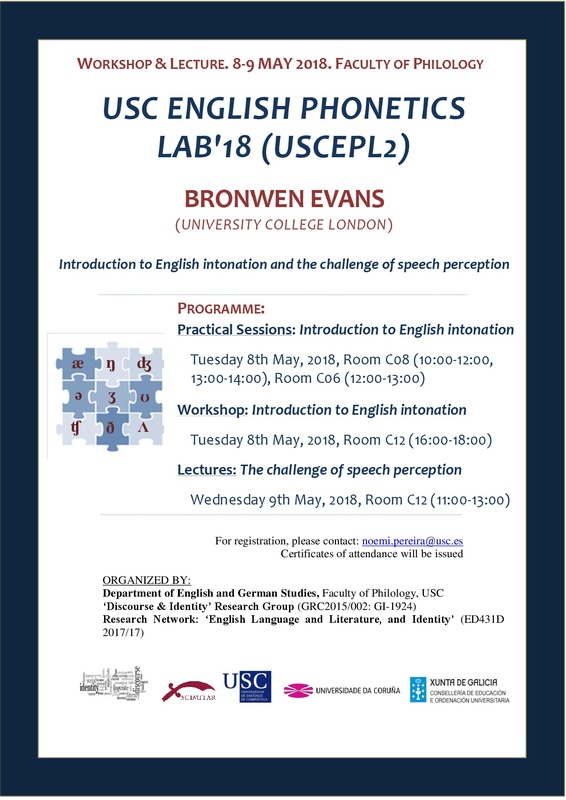 The D&I Research Group will host a workshop and series of lectures delivered by Bronwen Evans (U. College London). More Information. 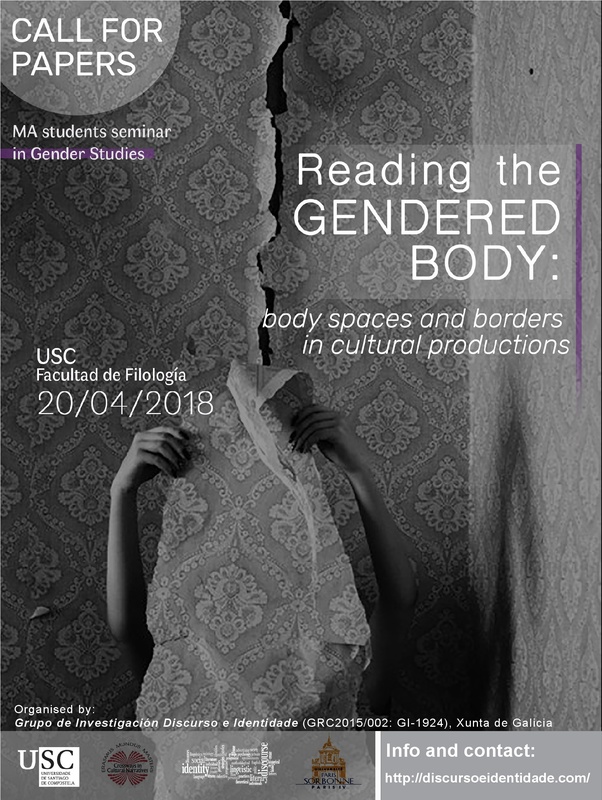 On 20th April, the D&I Research Group will host the Seminar entitled ‘Reading the Gendered Body’, organized by the students of the M.A. in English Studies. Faculty of Philology. University of Santiago de Compostela. More Information. 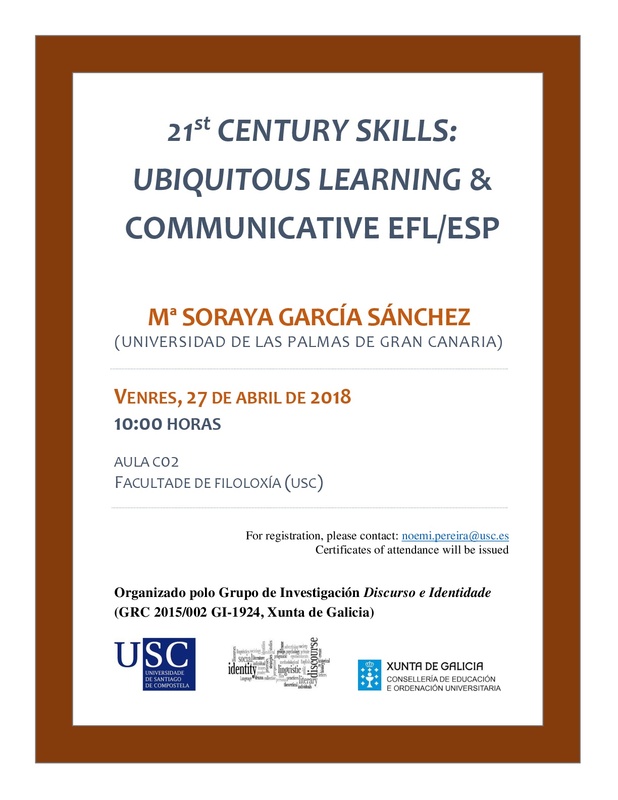 On 27th April, the D&I Research Group will host a lecture delivered by Mª Soraya García Sánchez (Universidad de Las Palmas de Gran Canaria) and entitled ‘21st Century Skills: Ubiquitous Learning & Communicative EFL/ESP’. More information. 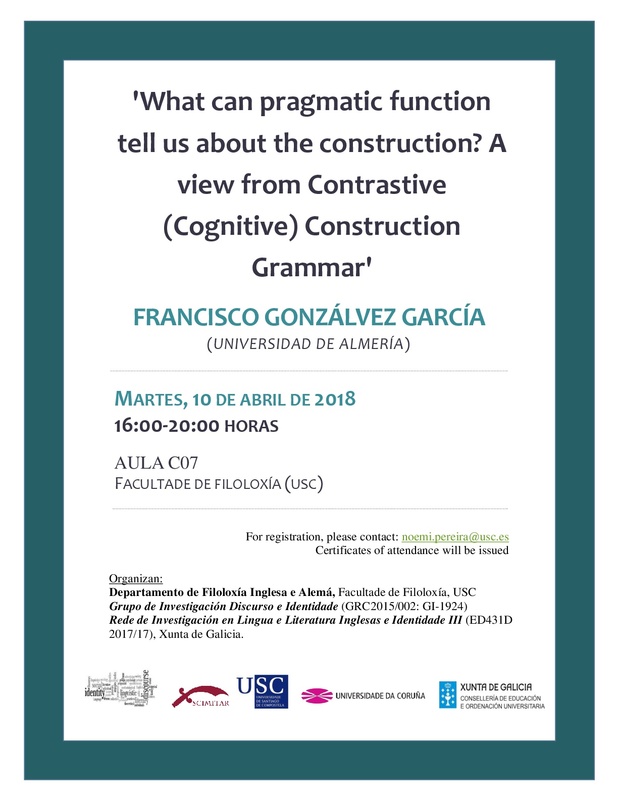 On 10th April, the D&I Research Group will host a lecture delivered Francisco Gonzálvez García (Universidad de Almería) and entitled ‘What can pragmatic function tell us about the construction? A view from Contrastive (Cognitive) Construction Grammar’. More information. The D&I Research Group will host a series of seminars and lectures delivered by Professor Christopher Norris. Faculty of Philology. University of Santiago de Compostela. 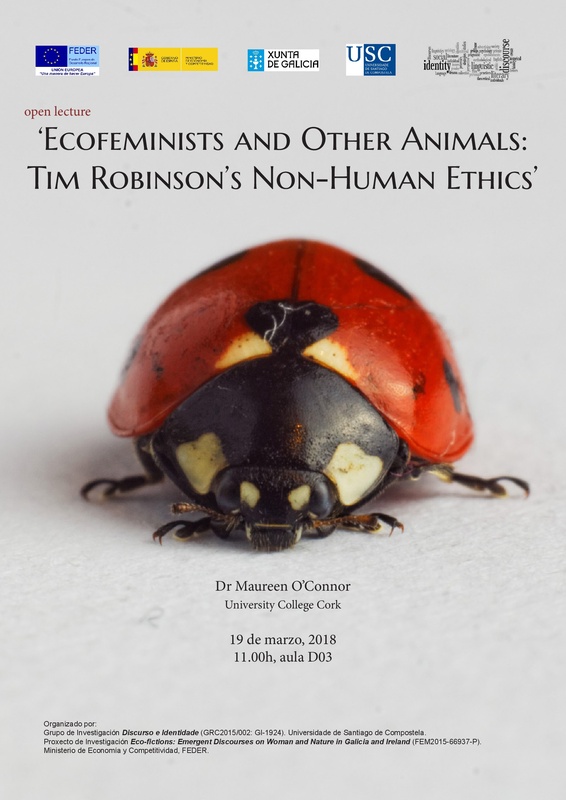 On 19th March, the D&I Research Group will host a conference delivered by Maureen O’Connor (University College Cork) and entitled “Ecofeminists and Other Animals: Tim Robinson’s Non-Human Ethics”. Máis información. Fashion, Dress and Identity in South Asian Diaspora Narratives: From the Eighteenth Century to Monica Ali (Palgrave, 2018) is the first book-length study to explore the sartorial politics of identity in the literature of the South Asian diaspora in Britain. Using fashion and dress as the main focus of analysis, and linking them with a myriad of identity concerns, the book takes the reader on a journey from the eighteenth century to the new millennium, from early travel account by South Asian writers to contemporary British-Asian fictions. Besides sartorial readings of other key authors and texts, the book provides an in-depth exploration of Kamala Markandaya’s The Nowhere Man (1972), Hanif Kureishi’s The Buddha of Suburbia (1990), Meera Syal’s Life Isn’t All Ha Ha Hee Hee (1999) and Monica Ali’s Brick Lane (2003).This work examines what an analysis of dress contributes to the interpretation of the featured texts, their contexts and identity politics, but it also considers what literature has added to past and present discussions on the South Asian dressed body in Britain. Endowed with an interdisciplinary emphasis, the book is of interest to students and academics in a variety of fields, including literary criticism, socio-cultural studies and fashion theory. More information. Intersections: Gender and Identity in the Short Fiction of Contemporary British Women Writers, coordinated by Laura Lojo Rodríguez, seeks to examine how the intersections of ethnicity, nation, gender, class and sexuality are articulated in the short fiction of contemporary British women writers. 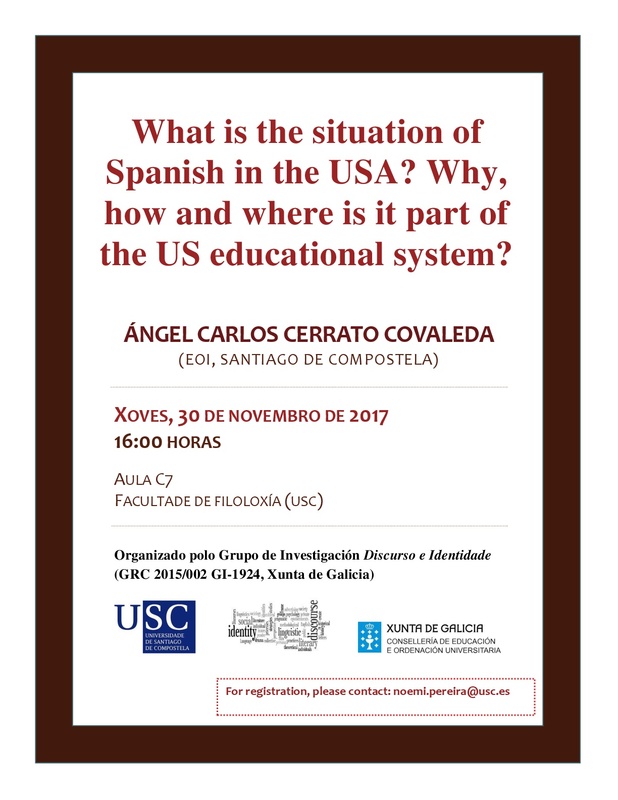 On 30 November 2017, D&I hosts a lecture by Ángel Carlos Cerrato Covaleda (EOI, Santiago de Compostela) entitled “What is the situation of Spanish in the USA? Why, how and where is it part of the US educational system?”. More Information. Round Table ‘Cultura despois do Prestige’ (Uxía, Rocío Castro, Chus Nogueira) and poetry reading (Marilar Aleixandre, Ana Romaní, Rafa Villar, Estevo Creus, María Lado, Ismael Ramos, Antón Blanco, Arancha Nogueira). Sala de profesores de la Facultade de Geografía e Historia (USC). More Information. 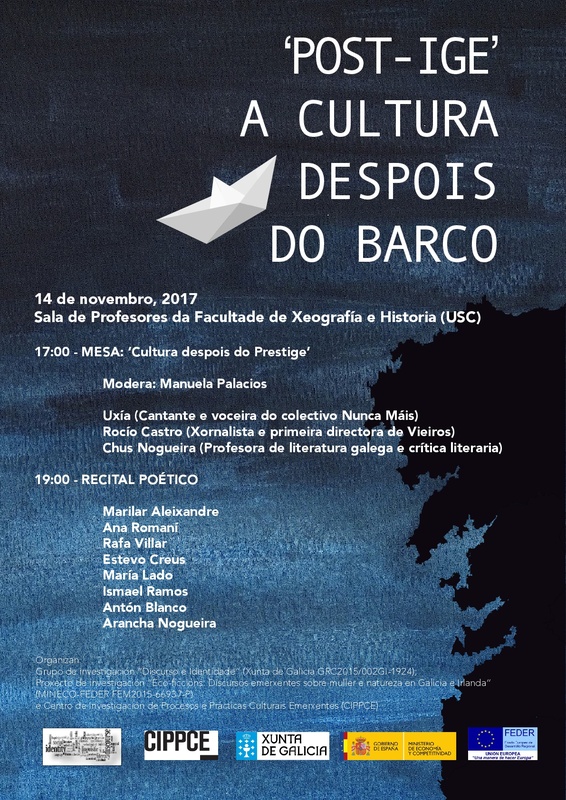 Seminar on ecocriticism, jointly organised by the research project ‘Eco-Fictions’, the D&I Research Group, the Research Centre for Emerging Cultural Processes and Practices (CIPPCE) and Asociación Galega de Crítica (AGC). Casa das Campás, Pontevedra. More Information. 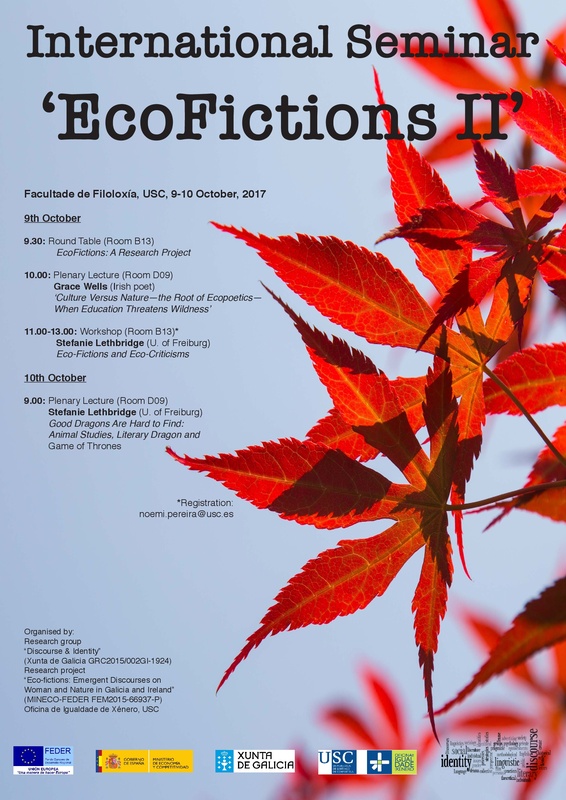 Second Edition of the International Seminar ‘Eco-Fictions’. 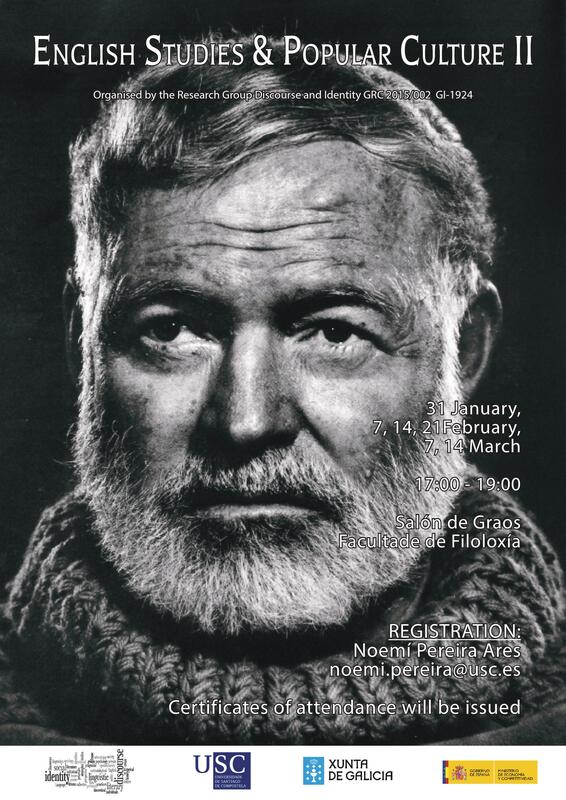 Plenary Lecture: Grace Wells (Irish poet); Workshop: Stefanie Lethbridge (U. of Freiburg). More Information. Martín Fernández Fernández, Carmen González Varela, Regina Martínez Ponciano and Arancha Rodríguez Fernández have obtained a predoctoral research grant from the Xunta de Galicia. 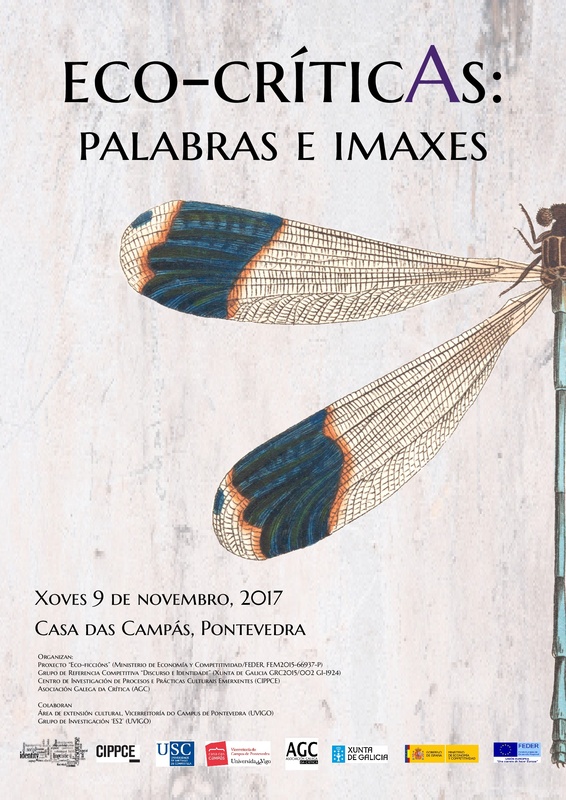 Second Edition of the International Conference ‘The Discourse of Identity’, Facultade de Filoloxía, Universidade de Santiago de Compostela. More Information. The workshop and conference will be held at the Faculty of Philology, 2-3 May 2017. Organized by the Research Group D&I and the SCIMITAR Team. Coordinators: María de los Ángeles Gómez González and Teresa Sánchez Roura. More Information. SCIMITAR organises a workshop which intends to offer an (advanced) introduction to the use of electronic text corpora for the study of learner language with a focus on English as a Foreign Language (EFL). 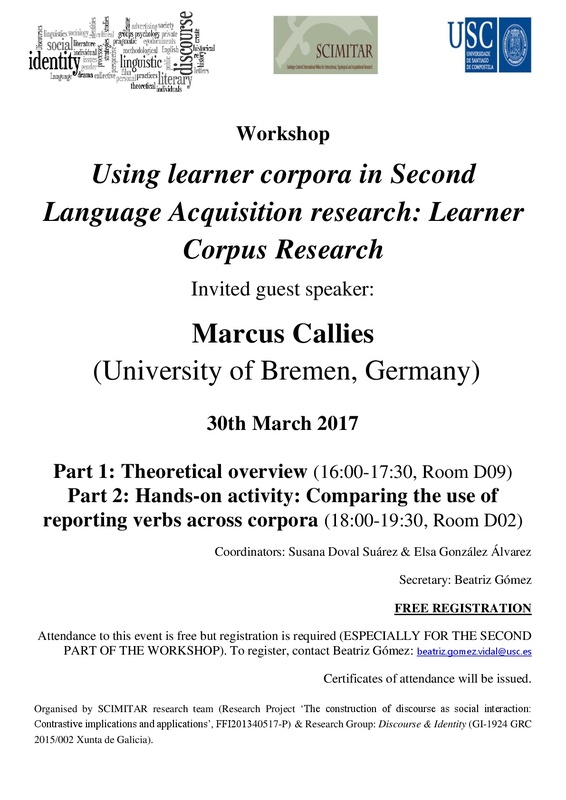 Invited Guest Speaker: Marcus Callies (University of Bremen, Germany). More Information. Second Edition of the Lecture Series ‘English Studies & Popular Culture’. The event, organized by the students of the Master’s Degree in Advanced English Studies and its Applications and coordinated by Dr. Laura Lojo Rodríguez and Jorge Rodríguez Durán, will be held at the Faculty of Philology, USC, from January 31 to March 14 2017. Download Poster. Download Programme. 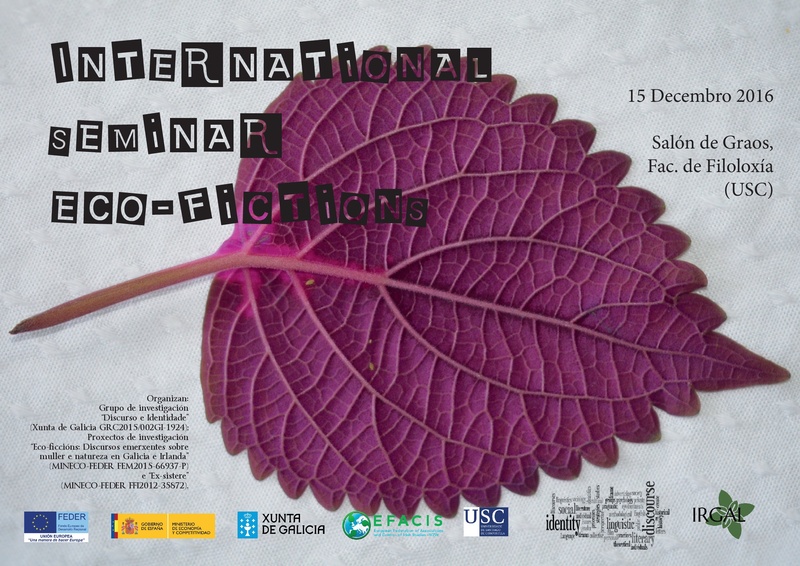 The International Seminar ‘Eco-Fictions’ will be held at the Facultade de Filoloxía, 15 December 2016. The seminar is jointly organized by D&I and the Research Project ‘Eco-Fictions’. Download Poster. 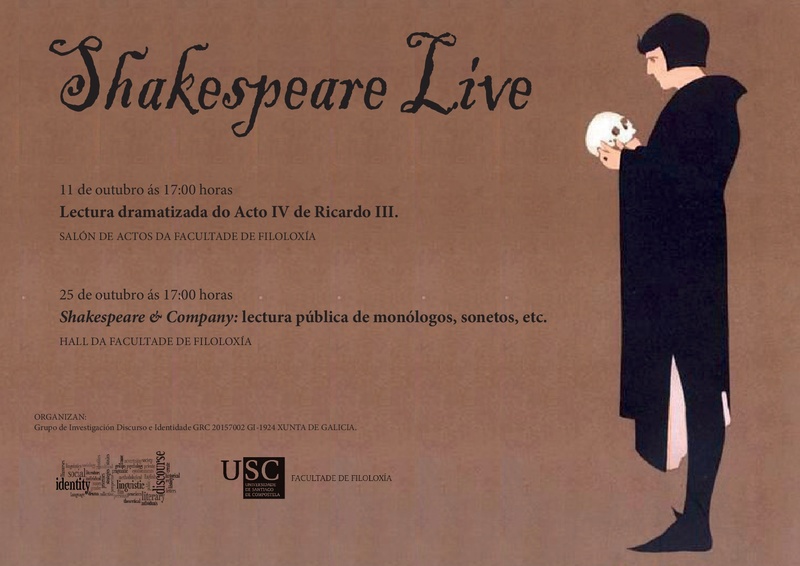 Reading of Shakespeare’s Richard III and selected poems and monologues. Download Poster. 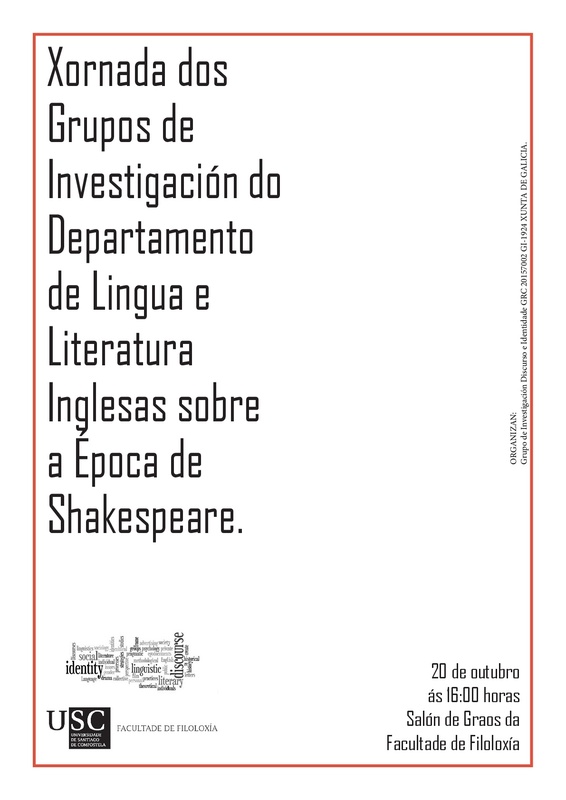 On 20 October, the Research Groups in the Department of English and German Studies (USC) host a series of lectures on Shakespeare. Download Poster. 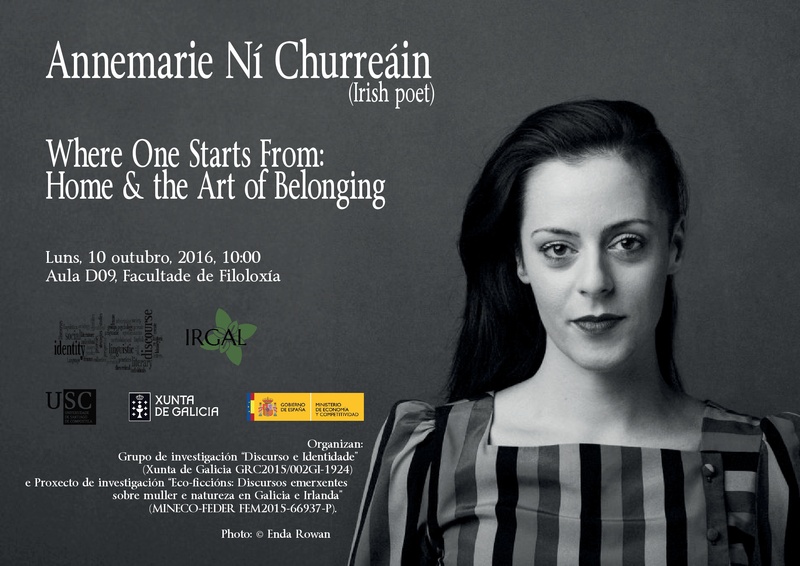 On 10 October, in collaboration with the Research Projects ‘Ex-sistere’ and ‘Eco-fictions’ led by Manuela Palacios González, D&I hosts a lecture by Annemarie Ní Churreáin entitled ‘Where One Starts From: Home & the Art of Belonging’. Download Poster. 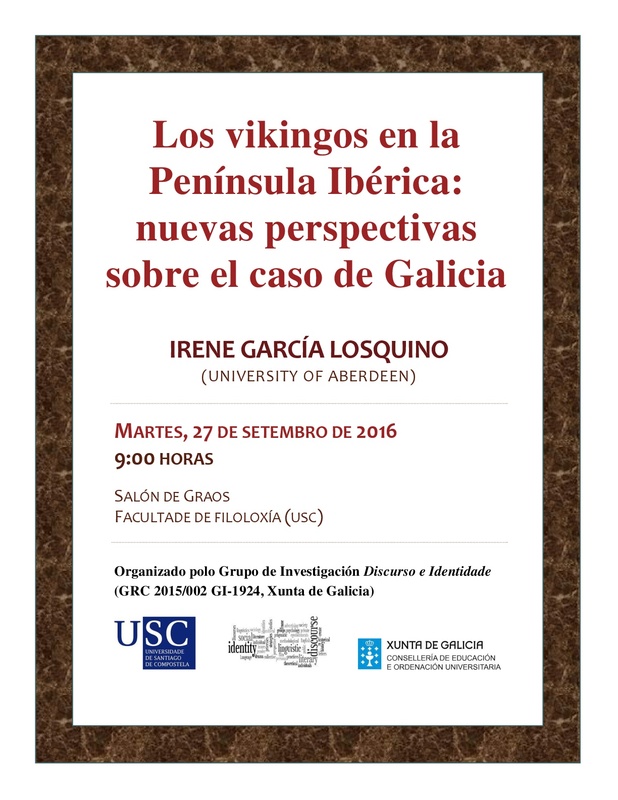 On 27 September, D&I hosts a lecture by Irene García Losquiño (University of Aberdeen) entitled ‘Los Vikingos en la Península Ibérica: Nuevas Perspectivas sobre el Caso de Galicia’. Download Poster. D&I hosts a seminar and lecture by L.J.F. 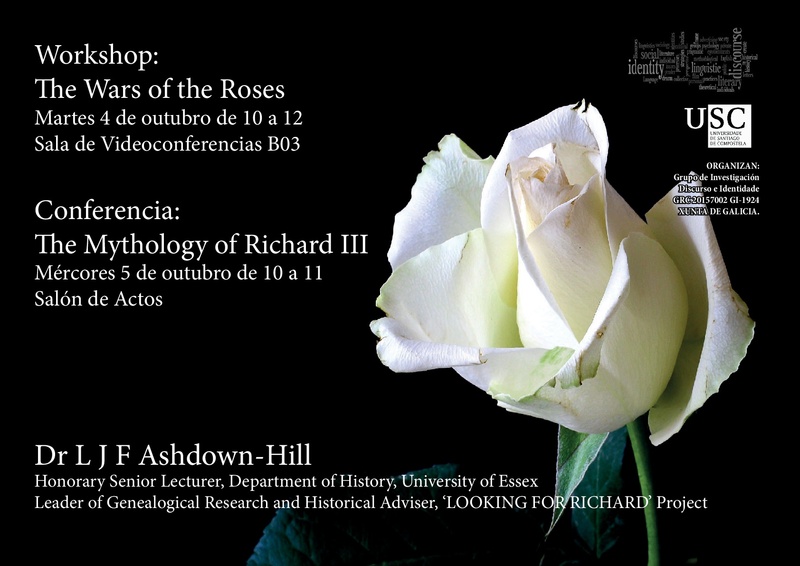 Ashdown-Hill entitled ‘The Wars of the Roses’ and ‘The Mythology of Richard III’. Download Poster. Cecilia Marchetto Santorun and Inmaculada Pérez Casal have obtained a predoctoral research grant from the Xunta de Galicia. 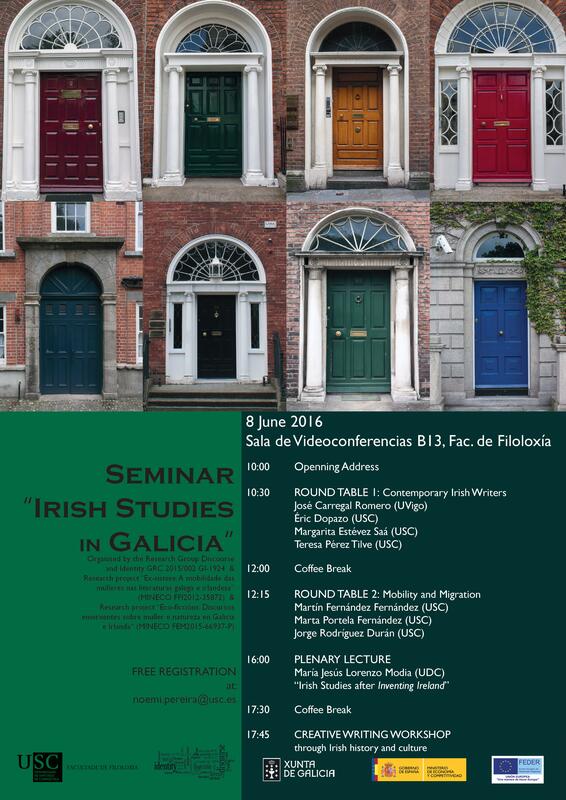 On 8 June, in collaboration with the research projects ‘Ex-sistere’ and ‘Eco-fictions’ led by Manuela Palacios González, D&I organises a seminar where junior researchers will present the studies they are currently carrying out within the area of Irish Studies. 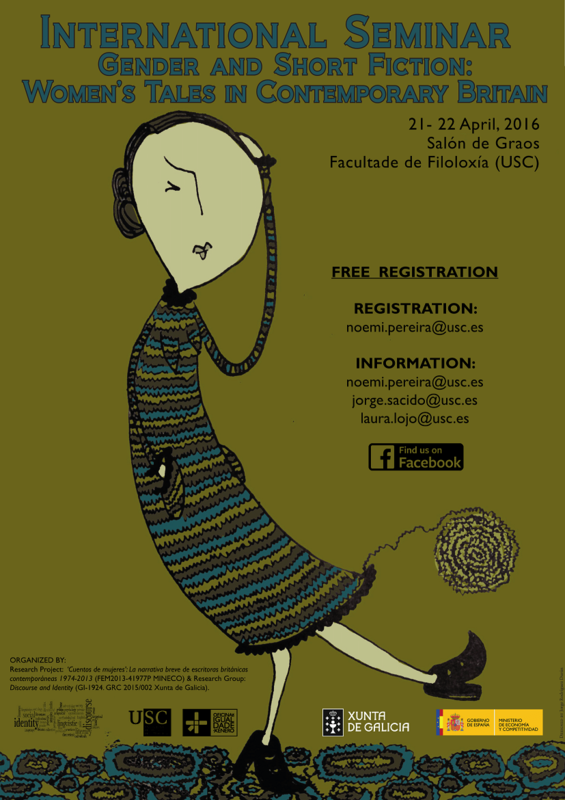 The event includes a plenary lecture by Prof. María Jesús Lorenzo Modia (UDC). Download Poster. 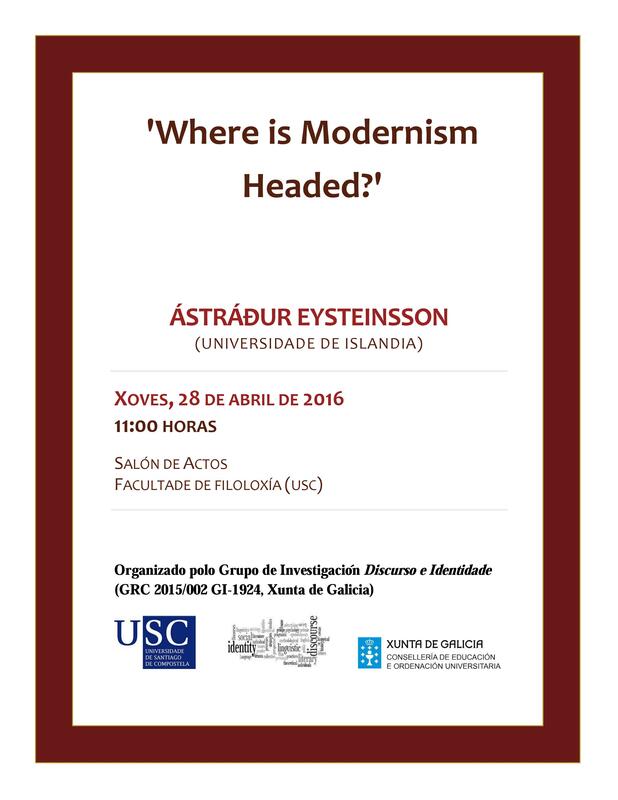 On 28 April, D&I hosts a lecture by Ástráður Eysteinsson (University of Iceland) entitled ‘Where is Modernism Headed?’ Download Poster. 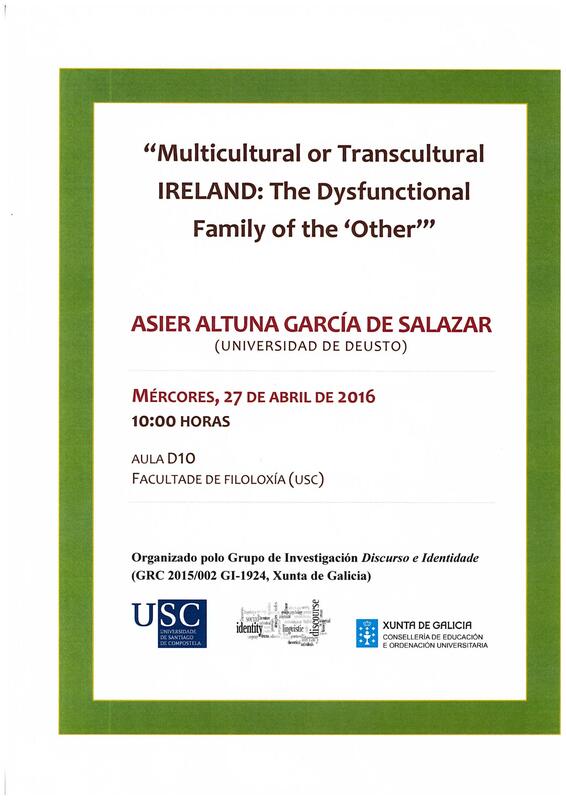 On 27 April, D&I hosts a lecture by Asier Altuna García de Salazar (Universidad de Deusto) entitled ‘Multicultural or Transcultural Ireland: The Dysfunctional Family of the “Other”‘. Download Poster. On 21-22 April, D&I organises the International Seminar ‘Gender & Short Fiction’ where internationally renowned scholars will discuss the relationship between gender and genre in contemporary fiction. The seminar is honoured with the presence of Scottish writer Janice Galloway, who will deliver a plenary lecture on Thursday, 21st. This seminar is part of the activities organized under a National Research Project entitled “‘Women’s Tales’: The Short Fiction of Contemporary British Writers 1974-2013”, led by Jorge Sacido Romero and funded by the Spanish Ministry of Economy and Competitiveness (FEM2013-41977). Download Poster. Download Programme. The event, organized by the students of the Master’s Degree in Advanced English Studies and its Applications and coordinated by Dr. Laura Lojo Rodríguez and Jorge Rodríguez Durán, will be held at the Faculty of Philology, USC, from February 2 to March 8 2016. Download Poster. Download Programme. A resarch project led by members of D&I receives funding from the Spanish Ministry of Economy and Competitiveness (MINECO). Entitled Eco-fictions: Emergent Discourses on Woman and Nature in Galicia and Ireland (FEM2015-66937-P), the projects is led by Manuela Palacios González. Member of the group Margarita Estévez-Saá is also part of this project. 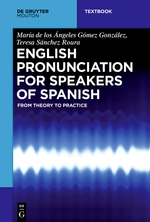 English Pronunciation for Speakers of Spanish: From Theory to Practice (Mouton de Gruyter, 2016), written by Mª de los Ángeles Gómez González and Teresa Sánchez Roura, and including a digital version: English Pronunciation for Speakers of Spanish: From Theory to Practice (DVD, Toolkit). The book combines theoretical issues and applications to practice, but it also adopts a contrastive English-Spanish approach to better suit the needs of Spanish-speaking learners of English (SSLE), enabling them to build gradually on the knowledge gained in each chapter. The book covers the key concepts of English phonetics and phonology in seven chapters written in an accessible and engaging style. It also includes over a hundred written and audio exercises with corresponding keys and different kinds of artwork. The book’s companion website, EPSS Multimedia Lab, that is useful for the self-taught student and the busy lecturer alike. Download Image. Book launch. Media Coverage. D&I receives funding from the Galician Regional Government (Xunta de Galicia) as a Competitive Reference Research Group. Los ritos de los sentidos. Poesía árabe (Cantarabia, 2015), anthology, translation, introduction and appendixes by Jaouad Elouafi, Bahi Takkouche, Manuela Palacios and Arturo Casas. 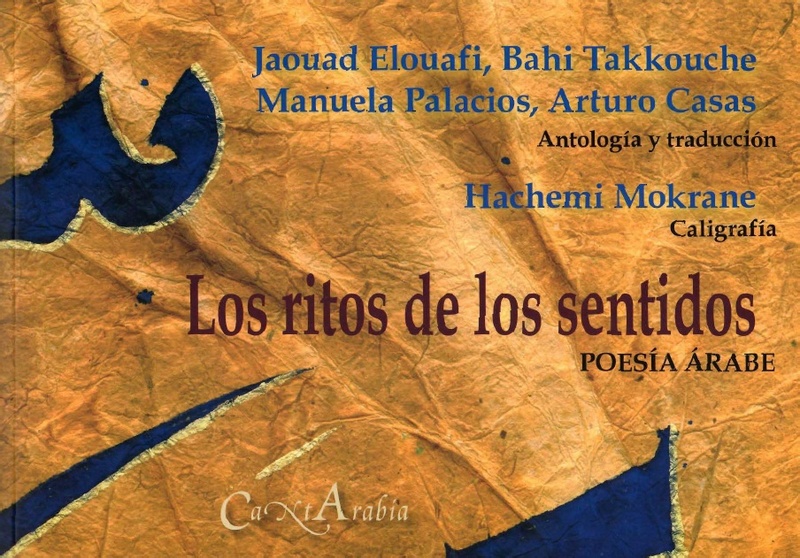 The work, coedited and co-translated by the group member Manuela Palacios González, constitutes a selection of Arab poetry on the body and the culture that surrounds, dresses and hides it. The bodies that inhabit these poems enjoy and suffer, long for the touch of other bodies or the union with a transcendent spirit. These bodies strive to be recognized in the other, in the community or in the intimate fusion with nature. We hear the cry of their gagged mouths, we follow their wandering footsteps in exile, we are complicit in their dreams and vigils, we breathe with them the scent of cardamom and, through their songs, we contemplate the fiery clouds. Real or contrived, these bodies appear conspicuously tangible on some occasions, as in Nizar Qabbani’s, Fawyziya Abu-Jalid’s or Mohammed Bennis’ verses; on others they appear implicitly through tropes that personify poetry or the artistic inspiration, thereby allowing us to see, touch and feel the world. Download Image. 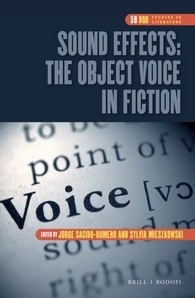 Sound Effects: The Object Voice in Fiction (Brill/Rodopi, 2015), edited by Jorge Sacido Romero and Sylvia Mieszkowski. The volume combines literary criticism and psychoanalytic theory in eleven original articles which explore the potential of the object voice as an analytic tool to approach fiction. Alongside the gaze, the voice is Jacques Lacan’s original addition to the set of partial objects of classical psychoanalysis, and has only recently been theorised by Mladen Dolar in A Voice and Nothing More (2006). With notable exceptions like Garrett Stewart’s Reading Voices (1990), the sonorous element in fiction has received little scholarly attention in comparison with poetry and drama Sound Effects is a contribution to the burgeoning field of sound studies, and sets out to fill this gap through selective readings of English and American fiction of the last two hundred years, including works by James Joyce, Y. M. Foster, V. S. Pritchett, Muriel Spark, Thomas Pynchon o James Chapman. Download Image.